The Café Bernardo is one of many California-style restaurants in the Paragary Restaurant Group in Sacramento and Davis, and like most of the Paragary eateries, the food and atmosphere are pleasant. 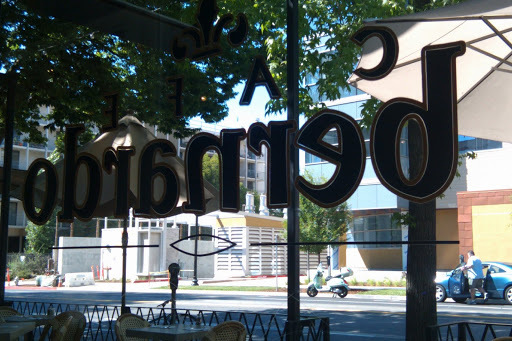 There are three Café Bernardo restaurants, two in midtown Sacramento and a third in Davis. I usually visit the 15th and R Street location, but today I am at the 28th Street and Capitol Avenue restaurant. Before I tried their ground chuck burger, I was hooked on their Grilled Chicken Sandwich. Café Bernardo also offers a Turkey Burger. One of those Portobello Mushroom burgers is on the menu at the 15th and R Street location. Track me down and stab me in the throat if I ever post that I have tried and loved a Portobello Mushroom burger! The Niman Ranch Ground Chuck Burger is a 7 oz hand-made patty. Cafe Bernardo receives the chuck directly from the Niman Ranch in Bay Area daily where they grind the beef on site. The quality of the chuck is evident though it is difficult to believe my patty started out at over 1/3 of a pound. It seemed smaller since chuck should not lose much fat in the grilling process. Café Bernardo uses ordinary iceberg lettuce on the burger, which is surprising for a place that offers six different salads. The burger also comes with a thin slice of tomato and red onion. (My tomato was a bit beat up.) The menu proudly points out the pickles are house made. They did not seem any different from other chip-sliced pickles I have tasted on most of the hamburgers in town. Then, there’s JB’s Special Sauce which does not taste terribly different from thousand island dressing, but is, like the pickles, house made; all of this on a quality, grilled, French bun. I cannot find fault with this hamburger, just nothing to get excited about. It is as if I would have like it better if I were to eat all the components separately. The fries, on the other hand, are cut from skin-on potatoes and are salty, crispy, and exceptional. The Niman Ranch Ground Chuck Burger goes for a little over $8. That is a decent deal if you do not want cheese ($1.50), a side of fries ($1.50), and a $2.25 iced tea. After all that the bill comes to over $13, which I guess is about right considering the quality of food and the clean, casual environment. 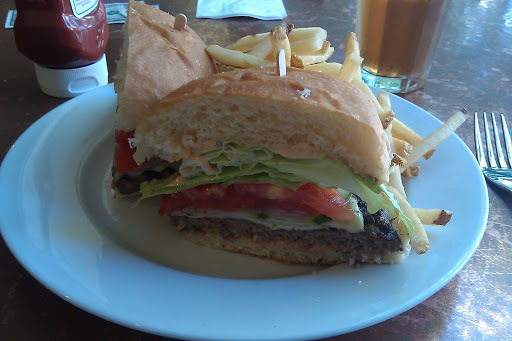 The Niman Ranch Ground Chuck Burger is a good burger, but I think I will stick with the Grilled Chicken Sandwich next time I visit Café Bernardo. A final note: Café Bernardo offers convenient online ordering; however, I have tested this app nearly a dozen times and have either received a “cannot display webpage” or a “request aborted due to heavy system load” message. Other Paragary restaurants offer an online customer reservations service. I tested that and received the “request aborted due to heavy system load” message.